In the late Nineteenth Century the log cabin patchwork design was very popular in the United Kingdom and in the Unites States of America.This design has an equal number of light and dark shades of fabric that radiate out from the square in the centre and is one of the simplest blocks to sew. 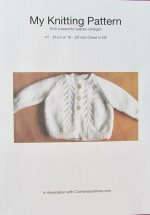 It is still very popular today as it can be sewn fairly quickly. It is sewn into a block and then the separate blocks can be sewn to form a quilt that will give a light and dark patterned design depending on how they are sewn together. One block could be used to make a cushion cover and the size can be enlarged by putting a border around the block. Other types of patchwork include the basic stages of patchwork, the Ohio Star and the Sail Boat to name a few. The central square is said to represent the fire, the light fabric depicts the area of the room that is lit up by the fire and the darker fabric reflects the darker side of the room. 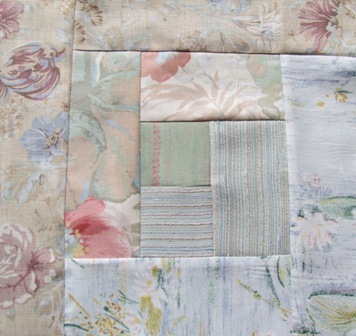 To make this patchwork block a total of seven different fabrics will be used. Choose your colour base and then three light shades of this colour and three darker shades. These can be mix of plain and patterned fabrics or all patterned.The seventh piece of fabric will the the central square, this could be a brighter or darker shade to either stand out or blend into the coloured theme of the block. There are many shopping outlets that specialise in craft fabric such as Homecraft. 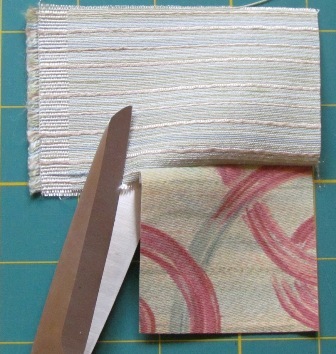 Most of the time needed for this design will be taken up by cutting the materials into strips. Each strip has to go along two sides of the block so you will need to cut two strips for each colour or a one long one that can be cut. Try to cut your patchwork pieces as accurately as possible to ensure the block fits together well. One of the most important points to remember is to straighten the cut edges to make sure they are at right angles with the selvedge. This will ensure that the edges of the material match when sewn. One central square is cut about 2 1/4 inches (6cms). 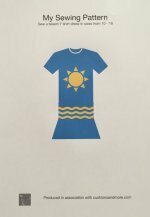 It is best to mark the fabric either with numbers,letters or symbols so that the same shade is use in the similar way on all blocks. 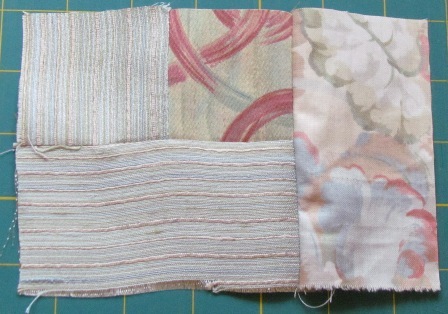 These are cut into strips of 2 1/4 inches (6cms) wide. The lengths needed will vary and will increase as more strips are added. 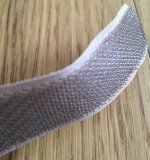 The longest length for the outer strips will be about 13 1/2 inches (34cms). All the strips could be cut this length and then be cut to size when the pieces are sewn together. One strip could be used for 2 or 3 blocks if the shorter lengths are needed. Using these sizes the finished patchwork block will be 12 inches (30cms) square. The sizes can be altered by increasing or decreasing the size of the central square and the width of the strips. Take the centre square and the first light fabric (cut to the same size as the central square). Place right sides together, sew together and trim the seam.Open out and press the seam allowance towards the first fabric. 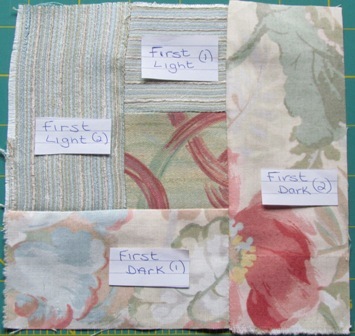 Take a second strip of the same light fabric and with right side together sew the length of the first fabric square and the central square.This will then give a square that is 3/4 the first light fabric and 1/4 will be the central square. The first dark fabric strip is then placed right sides together to the opposite side of the central square and the first light fabric strip. Sew, trim and press towards the attaching strip. Take a second strip of the first dark fabric and place right sides together along the side that includes the remaining side of the central square.The block will then look like a square with the central piece in the middle. 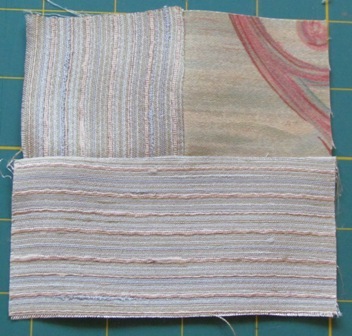 The second light and dark fabric is added in a similar way, with the first strip attached to the side of the square making it a rectangle and the second sewn along the full length of the bottom of the rectangle making it into a square again. Again attach the third light and dark fabric strips as above.The block will then show L shapes of light fabric on one side and dark on the other of the central square. This log cabin patchwork block can now be used as a wall hanging, a cushion cover or to make a quilt. 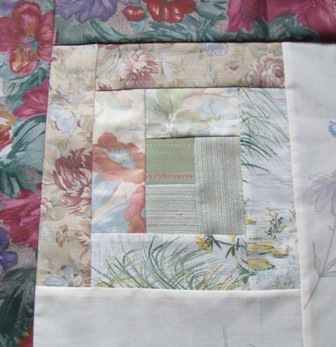 I have really enjoyed making the log cabin patchwork design and am going to join several block to make a quilt. I have even started a second one.